The artwork depicts a SASR RAEME Craftsman conduction heavy repair in the field. 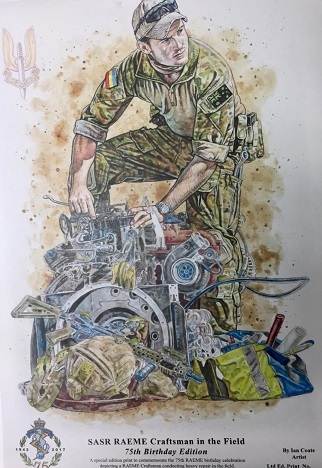 The artist Ian Coate was commissioned by SASR to produce a limited edition SASR RAEME Craftsman in the Field. The special edition print has been produced to commemorate the 75th RAEME birthday. The artwork depicts a RAEME Craftsman conduction heavy repair in the field. There are only 75 prints in the run, of which a number were sold on the day of the unveiling. Only a limited number remain. 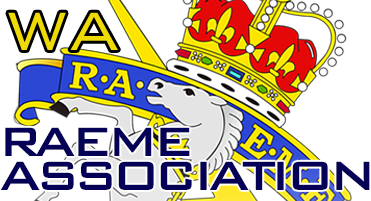 All proceeds from the sales will go the SASR Museum Fund.